The ExpressSAS H680 provides high-speed 6Gb/s performance at 600MB/s per port. By utilizing a serial, point-to-point architecture, in addition to PCI Express 2.0 bus technology, ExpressSAS 6Gb/s HBAs are engineered for demanding IT and digital media applications. The ExpressSAS H680 features eight external ports and allows connections to 1024 end-point devices. ATTO ExpressSAS 6Gb/s Host Bus Adapters (HBAs) deliver the fastest available connection to SAS or SATA tape or disk storage. 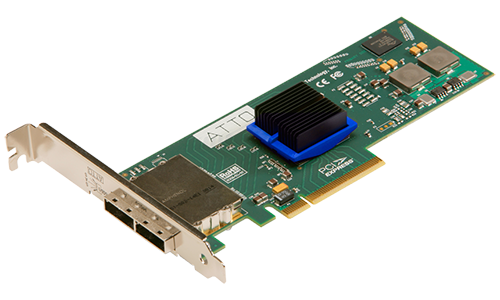 With a full range of port configurations and driver support, easy-to-use features, extensive industry qualifications and support for up to 2,048 end devices, ATTO has a 6Gb/s SAS HBA design to meet your performance needs. Included with all ATTO HBAs is an easy-to-use utility ConfigTool and vConfigTool, enabling management, monitoring and configuration which leverages an intuitive GUI. ATTO's exclusive, field-proven Advanced Data Streaming (ADS) Technology helps users meet the most demanding performance requirements of bandwidth-intensive applications. ADS achieves this performance increase by integrating a combination of features engineered to allow for the controlled acceleration of data transfers. ATTO ExpressSAS SAS/SATA Host Bus Adapterss (HBAs) provide high-performance data protection to direct-attached SAS and SATA storage. ExpressSAS HBAs are ideal for increased connectivity and maximum performance for data center flexibility. Leveraging 30 years of technology development, the ExpressSAS 6Gb/s host bus adapter (HBA) product line was the first 6Gb/s-based family of HBAs available in the market. ExpressSAS 6Gb/s HBAs work seamlessly with a wide array of third party products, including hard disk drives and solid state disks, tape drives and many other SAS and SATA infrastructure products. ExpressSAS 6Gb/s SAS/SATA HBAs are available in a variety of port configurations, providing the most flexible connectivity to SAS/SATA storage. With 8 external, 8 internal, 4 external/4 internal, or a two-host-adapters-in-one configuration with 16 external or 16 internal ports, users benfits from efficient scalability and more options from which to choose the best SAS/SATA HBA for their application. ExpressSAS 6Gb/s HBAs combine 6Gb/s SAS speeds and x8 PCI Express 2.0 with powerful hardware and software elements to manage latency in real-time environments. Exclusive Advanced Data Streaming (ADS) Technology maximizes CPU processes to deliver smooth and reliable data transfers and the hightest consistent performance. ATTO pays close attention to detail in board design and signal integrity to minimize transmission errors and data corruption. These differentiating capabilities make ATTO the premier choice for high-performance direct-attached SAS/SATA storage connectivity. The easy-to-use ATTO ConfigTool features an intuitive GUI that simplifies the installation, management and monitoring of the HBA. With advanced troubleshooting and performance tuning capabilities, ExpressSAS HBAs provide users with sophisticated diagnostics and flexibility to control settings for specific applications. The ExpressSAS 6Gb/s SAS/SATA HBAs offer the fastest available connection to direct-attached SAS or SATA storage. The impressive speed of the ExpressSAS family of next-generation 6Gb/s HBAs delivers a future-proof solution for data-intensive IT and digital media applications such as tape backup, data warehousing, high-definition video, post-production, and digital film production. Latency-management technology that controls the acceleration of data transfers to move large amounts of data faster and more efficiently. ExpressSAS 12Gb HBAs combine 12Gb/s SAS speeds and x8 PCI Express 3.0 with powerful hardware and software elements to manage latency in real-time environments. ATTO exclusive Advanced Data Streaming (ADS) technology maximizes CPU processes to deliver smooth and reliable data transfers and the highest consistent performance. ATTO 12Gb ExpressSAS host bus adapter (HBA) drivers are optimized to ensure that driver resources are located close to the system I/O. In addition, they support NUMA-aware applications and operating systems. NUMA is a system design that allows multiple processors in the same server to efficiently share memory. This reduces latency and increases I/O performance - especially important for data mining, business analytics and other processor-intensive applications. ATTO ExpressSAS HBAs feature Power Center Pro provides RAID 0, 1, 1e and 10 capabilities for internally-mounted disk drives. This feature is often required for end users often need to add a level of performance or protection to a boot drive group. With Power Center Pro RAID, you can protect a boot group against drive failure, or if you'd like to achieve faster boot times, you can bundle several drives together to improve overall performance. Additionally, Power Center Pro may be used to set up a server storage for general use. These are just a few examples of the many ways to use Power Center Pro to provide a cost-effective option that adds performance and protection to your storage architecture. 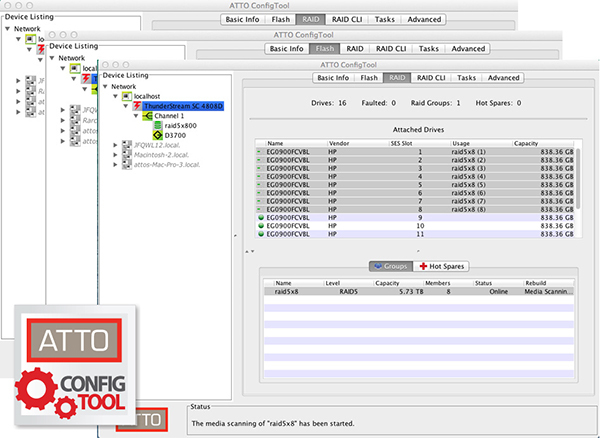 The easy-to-use ATTO ConfigTool features an intuitive GUI that simplifies the installation, management and monitoring of your HBA. 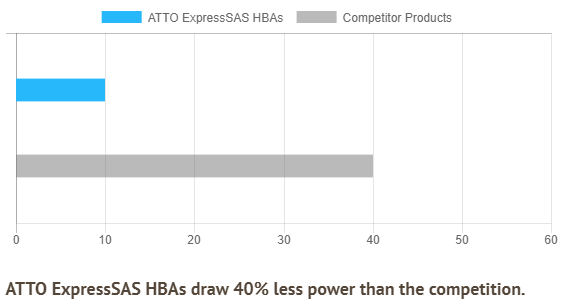 With advanced troubleshooting and performance tuning capabilities, ExpressSAS HBAs provide users with sophisticated diagnostics and the flexibility to control settings for specific applications. 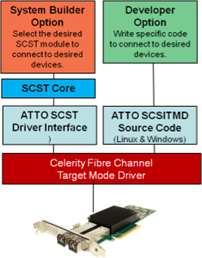 OEMs and system integrators can use ATTO's unique Target-mode Software Development Kit (SDK) or an industry standard SCST driver option to create unique branded storage and appliance solutions. Through a more tightly integrated driver, the ATTO's ExpressSAS SDK provides integrators complete control, ownership and flexibility in creating custom capabilities specifically to address your product design. Or for a quicker design option, integrators can take advantage of preset SCST modules, to get to market quickly. Extensive operating system support includes major software releases for Linux, Windows, Windows Server, macOS, illumos, VMware EXSI Server, and FreeBSD. Dimensions Length 5.600", Height 2.713" Length 5.600", Height 2.713" Length 6.600", Height 2.713"
ExpressSAS Host Adapters leverage the performance and scalability enhancements of Serial Attached SCSI (SAS) technology to deliver the fastest available connection to SAS/SATA storage. They boast an impressive 1200MB/s per port performance. Latency management technology is built into ATTO host bus adapters (HBAs) and RAID hardware. Advanced Data Streaming manages latency by providing controlled acceleration for smooth data streaming to maintain the highest consistent performance. ADS ensures best-in-industry data transfers for high-bandwidth applications.